Likembe: $850 for a Cassette? Oh, Come On!!! $850 for a Cassette? Oh, Come On!!! Yes, that's right: Someone is asking $850 dollars for the cassette version of the 1972 LP Master Guitarist Vol. 5 (African Songs LPAS 8014) by Nigeria's Sunny Adé & his Green Spot Band! I have long been astounded at the sort of prices some African music fans are willing to pay for scratchy old vinyl from the Continent - and in this case, not even vinyl, but a no-doubt-inferior cassette version of same! It puts one to mind of the 17th Century tulip mania. But you don't need $850 to listen to this recording. The blog Snap, Crackle & Pop posted it a few years back and you may have grabbed it then (the link to the file is now broken). And now I'm posting it again. You can have it for free! Strictly speaking, what I'm making available is not Master Guitarist Vol. 5 but another pressing that came out around 1984. 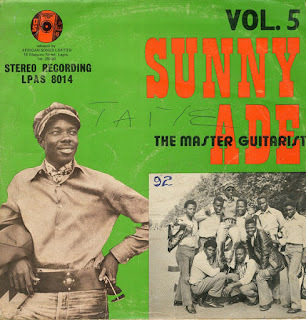 What happened was, when King Sunny Adé caused a sensation internationally around 1982 with his African Beats band, some smaller record companies hoped to cash in on the craze by reissuing material that had been recorded years earlier in Nigeria. This fly-by-night company Imported Nigeria licensed Master Guitarist Vol. 5 from African Songs, which had been Adé's record company in the early '70s, and issued it under the title Vintage King Sunny Adé (Imported Nigeria K001). What's doubly confusing is that the tracklist on Vintage doesn't even agree with that of Master Guitarist Vol. 5. In fact, the listings on the sleeve and record labels on Vintage don't agree either. But they are indisputably the same recording. In fact, I think Vintage is not even a "pirate" pressing - it was apparently officially licensed and legitimately issued. If all you have heard of King Sunny Adé is his recordings from the '80s and later, Master Guitarist Vol. 5 may come as something of a revelation. The Green Spots were Adé's first band, founded in 1967 after he left Moses Olaiya's Federal Rhythm Dandies, and their sound is not as dense and "sophisticated" as that of the later African Beats. Sunny Adé's brilliant guitar work, of course, shines through loud and clear. Here's Master Guitarist Vol. 5. I'm following the tracklisting from that pressing, and not that from the later Vintage King Sunny Adé. Enjoy! Download Master Guitarist Vol. 5 as a zipped file here. 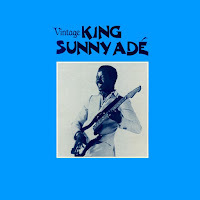 I've included scans from Vintage King Sunny Adé also. The record sleeve scans of Master Guitarist Vol. 5 are from Snap, Crackle & Pop. Thanks! A sweet treat that can't be beat, thanks! thank you very much I asked snap,crackle and pop unsuccessfully to repost it. And here it is. Hey, John, had no idea you revived Likembe after hiatus. Quite engaging and thanks! Hey Ambrose! Yeah, I've been at it now since last August. Make sure to check the archives for more music! $850 for a cassette, why are you surprised? Discogs has listing of some very serious prices for old African music. In all honesty, that much for a cassette is pure madness. I once saw someone bid and won a used Fela's Yellow Fever for over $100 when for that much, you could get Fela's Box Set 4 with 7 LPs, all new.